In 1955 or 56, I had my first aeronautical adventure, wearing a blue uniform. I was to follow it up some 9 years later with a longer adventure in another blue uniform, but that is another story. While in the Cub Scouts, our Den Mother, Mrs. Smuzynski, arranged for our den to take a plane trip. 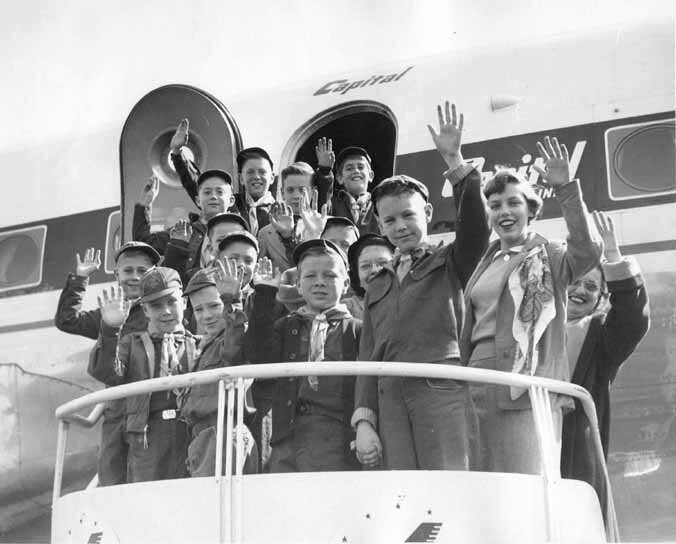 We flew on a Capitol Airlines DC-6. from National Airport1 to Friendship International1. We drove home from Baltimore. The picture below was taken prior to "blast-off". With the diligent efforts of Ron Hanson and his Mom, Alvin Smuzynski and myself, we have tried to identify as many kids and adults in the picture as possible. If you recognize anyone, please let me know. Place your mouse pointer over a face to see the name of the person. 1 For the benefit of you kids, National Airport is now called the Ronald Reagan Washington National Airport, and Friendship is now Baltimore-Washington International Thurgood Marshall Airport.